"We know that before 45,000 years ago, the only humans in Europe were Neanderthals. After 35,000 years ago, the only humans in Europe were modern humans. This is a dramatic transition," Reich says. There is archaeological evidence that modern humans interacted with Neanderthals during the time that they both lived in Europe: Changes in tool making technology, burial rituals, and body decoration imply a cultural exchange between the groups. "But we have very few skeletons from this period," Reich points out. 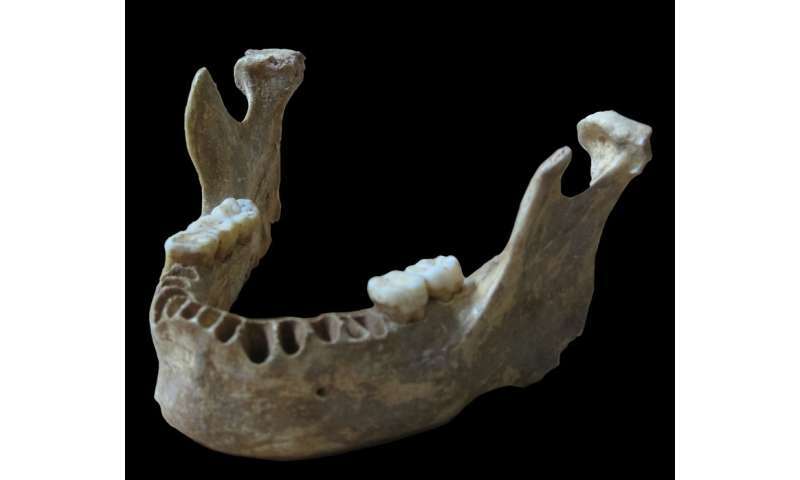 So the jawbone that archaeologists uncovered in Romania in 2002, which radiocarbon dating determined was between 37,000 and 42,000 years old, was an important find. "It's an amazing bone," Reich says. The jawbone was found along with the skull of another individual in a cave called Pe?tera cu Oase. No artifacts were discovered nearby, so anthropologists had no cultural clues about who the individuals were or how they lived. The physical features of the jawbone were predominantly those of modern humans, but some Neanderthal traits were also apparent, and the anthropologists proposed that the bone might have belonged to someone descended from both groups. Pääbo and Reich teamed up to investigate that possibility by analyzing DNA from the jawbone. 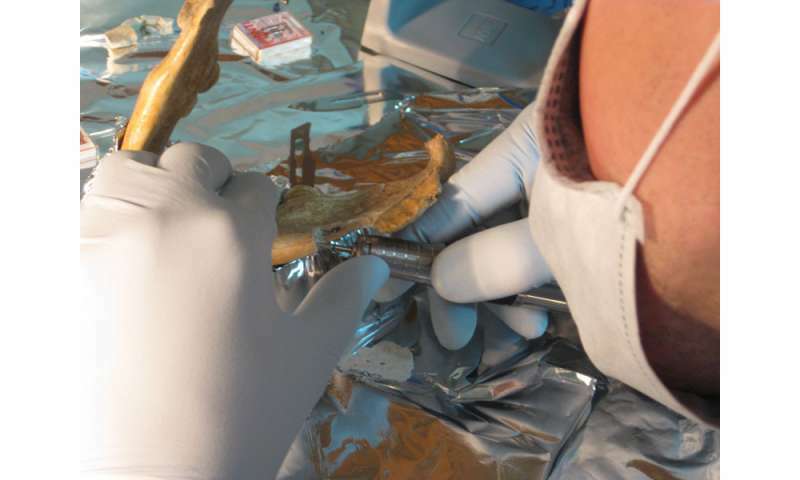 Trace amounts of ancient DNA can be recovered from bones as old as the Oase jawbone, but to analyze it, that ancient DNA must be sifted out of an overwhelming amount of DNA from other organisms. When Qiaomei Fu, who was a graduate student in Pääbo's lab, obtained DNA from the bone, most of it was from microbes that lived in the soil where the bone was found. Of the fraction of a percent that was human DNA, most had been introduced by people who handled the bone after its discovery. Using methods pioneered in Pääbo's lab, Fu enriched the proportion of human DNA in the sample, using genetic probes to retrieve pieces of DNA that spanned any of 3.7 million positions in the human genome that are considered useful in evaluating variation between human populations. Most of the DNA she ended up with was human, but came from people who had handled the jawbone since 2002, rather than the jawbone itself. Fu, who is now a postdoctoral researcher in Reich's group, solved that problem by restricting her analysis to DNA with a kind of damage that deteriorates the molecule over tens of thousands of years. Once they had discarded the contaminating DNA, Reich's team could compare the fossil's genome to genetic data from other groups. Through a series of statistical analyses, a surprising conclusion emerged. "The sample is more closely related to Neanderthals than any other modern human we've ever looked at before," Reich says. "We estimate that six to nine percent of its genome is from Neanderthals. This is an unprecedented amount. Europeans and East Asians today have more like two percent." That suggested the Oase individual's ancestry was recent. As DNA is passed on from generation to generation, segments are broken up and recombined, so that the DNA inherited from any one individual becomes interspersed with the DNA of other ancestors. Reich found segments of intact Neanderthal DNA in the fossil that were large enough to indicate that the Oase individual had a Neanderthal ancestor just four to six generations back. That suggests that modern humans interbred with Neanderthals after they had arrived in Europe. "It's an incredibly unexpected thing," Reich says. "In the last few years, we've documented interbreeding between Neanderthals and modern humans, but we never thought we'd be so lucky to find someone so close to that event." The Oase individual is not responsible for passing his Neanderthal ancestry on to present day humans, however. Reich found no evidence that he is closely related to later Europeans. "This sample, despite being in Romania, doesn't yet look like Europeans today," he says. "It is evidence of an initial modern human occupation of Europe that didn't give rise to the later population. There may have been a pioneering group of modern humans that got to Europe, but was later replaced by other groups." It is almost syllogistic that, since Neanderthals and 'moderns' had a common ancestor, for some time after the population divergence interbreeding would have been easy, and possibly likely, but with diminishing probability over time. The question should now be whether or not interbreeding producing fertile offspring occurred or was even possible at the time the Neanderthals died out. If it was possible, then they would have to be considered a separate race of the same species - Homo sapiens. Surely the offspring must have been fertile, otherwise this individual wouldn't have DNA from 4-6 generations previous? "It is evidence of an initial modern human occupation of Europe that didn't give rise to the later population." Poor Neanderthal, being so close and still doesn't make its genes into the modern population. @tadchem: "If it was possible, then they would have to be considered a separate race of the same species - Homo sapiens." Biologists could disagree. They look for genetic barriers, and the genetic evidence show sperm incompatibilities, lower fertility, in even the earliest introgression into the modern gene pool. So for them the evidence shows that these were different species (we and them), if not yet fully separated. @Jeffhans1: It gets better. Some African studies show signs (if weak as of yet) of introgressions from similarly separate populations, and the large Spanish sample of Homo (which I can't remember the name for) show signs of one as reported 1-2 years back. It could even be H. erectus that introgressed into Neanderthals and then the found group. Re: "We know that before 45,000 years ago, the only humans in Europe were Neanderthals." Serious scientists know that RNA-mediated amino acid substitutions link the epigenetic landscape to the physical landscape of DNA in all organized genomes of all genera. See, for example: Nothing in Biology Makes Any Sense Except in the Light of Evolution http://img.signal...nsky.pdf "...the so-called alpha chains of hemoglobin have identical sequences of amino acids in man and the chimpanzee, but they differ in a single amino acid (out of 141) in the gorilla" (p. 127). What this misrepresentation of biologically-based cause and effect shows us is that evolutionary theorists may continue to claim that they know what they do not know about how fixation of nutrient-dependent RNA-mediated amino acid substitutions differentiates cell types. Excerpt: "Using methods pioneered in Pääbo's lab, Fu enriched the proportion of human DNA in the sample, using genetic probes to retrieve pieces of DNA that spanned any of 3.7 million positions in the human genome that are considered useful in evaluating variation between human populations." What links changes in one jaw to one skull in the context of "evolution?" That is simply your own conjecture and is not supported by empirical evidence. Use the scientific method. What these reports have in common is the link from RNA-mediated cell type differentiation to biodiversity that is biophysically constrained by the ability to find nutrients and to reproduce. What these accurate representations do not have in common with ridiculous theories about mutations and evolution is that they are based on biological facts, not pseudoscientific nonsense. The citation to "The Man Who Bottled Evolution" makes no sense now that serious scientists are "Combating Evolution to Fight Disease." http://www.scienc...88.short All that Lenski's work has ever shown is that ecological adaptation is nutrient-dependent and pheromone-controlled in species from microbes to man via RNA-mediated links between metabolic networks and genetic networks. or are you being a creationist like jk now and trying to defend ALL the pseudoscience because of the similarities to your Philo talk? keep following me around, you might learn something nou! .... are you being a creationist like jk now and trying to defend ALL the pseudoscience because of the similarities to your Philo talk? What philo talk? You're not specific enough to even refute. Please use the scientific method. I don't even read JVK posts because I don't know enough about the subject to disentangle his word salad [as it appears to me],.... and whether he is a creationist crank or not,... he appears certainly to know more about the subject than I do, and since I respect science enough that to defeat his arguments by more than proxy, I would need to know the nuts and bolts of the topic at hand,... thus I do not engage,... despite rejecting creationism or even a god. Mutations perturb protein folding, which is why only the fixation of amino acid substitutions that stabilize the organized genomes of all genera has been linked from the epigenetic landscape to the physical landscape of DNA via metabolic networks and genetic networks in the context of their nutrient-dependent RNA-mediated physiology of reproduction. In species from E. coli to humans, the physiology of reproduction is nutrient-dependent and pheromone-controlled. That means the only thing Lenski has ever shown is that E. coli are genetically predisposed to ecologically adapt when the availability of nutrients changes. That's what I showed with examples from other species, and the examples refute ridiculous theories about mutations and evolution. Why aren't we discussing nutrient stress and/or social stress in the context of mutations and evolution? Does anyone else besides the biologically uninformed science idiot, Captain Stumpy, not realize the difference between a mutation and an amino acid substitution? How could a mutation link metabolic networks to genetic networks in the context of health and biodiversity? Does anyone else besides the biologically uninformed science idiot, Captain Stumpy, not realize the difference between a mutation and an amino acid substitution? The oldest RNAs are primarily associated with protein synthesis and export. If my model of RNA-mediated biologically based cause and effect did not link metabolic networks to genetic networks in all genera via their nutrient-dependent physiology of reproduction, Poole's group would not be desperately attempting to invent another theory of evolution. With Prof. Jun Ogawa and team at Kyoto University, we are working to engineer E. coli that can produce DNA via an alternative pathway to the ubiquitous ribonucleotide reductase pathway, which all life uses to generate DNA building blocks from RNA. This work may tell us if DNA could have evolved via a simpler route than the complex reaction performed by ribonucleotide reductases.